Eluktronics may not be a well-known brand in the high-performance gaming laptop/pc segment, but they have defied odds and produced a number of powerful and competitively priced machines that are sure to give big brands like Asus, Razer, MSI and Alienware a run for their money. In this Eluktronics N850EP6 Pro-X Review, we break down why you should probably stop and give this pretty decent laptop a second look. It meets the needs of graphic designers, gamers, music producers and high-performance PC enthusiasts. It also comes packed with great features and premium components like the NVIDIA GeForce GTX 1050 Ti graphics card and the Intel Core i7-8700 Hexa Core processor. Be that as it may, it’s still reasonably priced as compared to similarly equipped machines from established brands like the – Acer Predator Helios 300 or the MSI GE62VR Apache Pro-001 15.6 . The Eluktronics N850EP6 Pro-X comes from a small manufacturer that may not be well known. 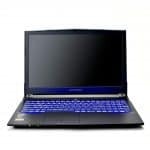 But it’s a very capable laptop that is sure to deliver beyond expectations and is good value for money. It may not be the fastest gaming laptop in the segment but it packs a mean punch. It brushes shoulders with some of the latest laptops such as the Acer Predator Helios 300 Gaming Laptop and the ASUS M580VD-EB76 VivoBook 15.6″ FHD Gaming Laptop . But while the Predator Helios is aesthetically appealing with gamer-centric design, our unit remains the-go-to gaming laptop for subtlety. With cases borrowed from Clevo, Eluktronics laptops are some of the most solidly built gaming laptops on the OEM market. The Eluktronics N850EP6 Pro-X really shines in terms of design as it features a clean and sturdy aluminum build. We particularly like the fact that Eluktronics decided to adopt a subtler but solid design as opposed to the aggressive and in your face designs in most gaming laptops today. This allows the Eluktronics N850EP6 Pro-X gaming laptop to fit in any environment you may choose to use it be it your studio, office or school without attracting too much attention (this without forgetting the fact this is an aggressive beast on the inside!). It’s great to see also that Eluktronics decided to get rid of the sharp polygonal corners present in some of its predecessors like the Eluktronics N850EP6 Pro-X Gaming Laptop that we think made the design look a bit eccentric and not well thought out. The full-sized keyboard’s configurable RGB lighting gives the laptop an extra layer of beauty and is sure to make those intensive gaming sessions even more immersive and rewarding. Meanwhile, the trackpad on the Eluktronics N850EP6 Pro-X is, however, a bit oddly positioned a few inches to the left (for right handed people) and not at the center like on most laptops but hey this is not an ordinary machine after all! As with many gaming laptops, this one also does have plenty of cooling which is evident because of the strategically positioned air vents at the rear. I mean just right below the hinge and at the bottom case. The attention to detail in the design is carried on here with the uniquely shaped vents that contribute towards giving the laptop its character. The bezel on the front panel is not very thick as compared to that on the Asus FX502VM-AS73 or the Acer Predator Helios 300 . But we still think Eluktronics can do better here by reducing the bezel size and providing the user with a sleeker and modern build. Moving on, the Eluktronics N850EP6 Pro-X measures 16.47 x 11.36 x 1.08 and weighs 6.8lbs; a bit heavy which is expected from a high-performance gaming laptop. But its overall compact design allows it to slide easily into any decently sized bag like a normal laptop. Moving around to the back one can easily get access to the internals by removing a few screws and popping the rear cover. Being a gaming machine the manufacturer does acknowledge the fact that it will attract a good number of power users and enthusiasts who will constantly want to pop the lid for upgrades. The Eluktronics N850EP6 Pro-X is fully upgradeable and provides room for various components like the RAM to be upgraded on the One empty RAM slot and One 2.5” 7mm HDD/SSD, SATA III interface with Caddy & Mounting hardware. With that, it secures a seat with other fairly future proof laptops. The screen is perhaps the most important in the Eluktronics N850EP6 Pro-X review as it’s the defining factor on the ability of any gaming laptop to provide the user immersive viewing experience. The Eluktronics N850EP6 Pro-X does not disappoint in this aspect as it features a 17.3″ Full HD IPS Anti-Glare WLED-backlit (1920 x 1080) display that provides excellent contrast and vibrant colors. This panel uses In-plane Switching (IPS) Technology, therefore, giving decent viewing angles, excellent picture quality and vivid colors that will make 1080p gaming and content creation or consumption a lot more enjoyable and immersive. The screen is not touch-enabled and this is fine because it is the norm with many gaming/performance laptop displays and it suffers a bit of glare when being used under direct sunlight. In terms of port selection, this baby is loaded with a variety of ports and interfaces. It features two USB 3.0 Ports, one USB 2.0, one USB 3.1 Gen 2 port (Type C) which is really great to see on this machine as this port provides cutting-edge technology in terms of connectivity and future proofing. It also has an HDMI (with HDCP), two Mini Display Ports for external display connectivity, Gigabit Ethernet, one Headphone jack, one Microphone jack, and an SD Card reader. Overall the Eluktronics N850EP6 Pro-X has all the necessary ports that you would require for every scenario and use. In a broader scale, the port system takes care of backward, present and the future compatibility with regard to external devices and interface connectivity. As we’ve mentioned before this laptop comes with a Premium Full-size RGB Backlit Keyboard with a 10-key numeric keypad. The lighting is configurable to the user’s taste through utility software that comes pre-installed with the Eluktronics N850EP6 Pro-X including the brightness as the backlighting can be quite intense if tuned to the max. As you would expect from a laptop primarily tuned for gaming this keyboard does not disappoint as the keys are quite responsive and offer a satisfying amount of key travel. The laptop has a trackpad which is a bit oddly positioned as mentioned before but it’s quite responsive. We did not experience any lagging or skipping when using it. This is basically a normal trackpad not much to say about it and most gamers will probably go with an external mouse for gaming like the Logitech MX Master 2S Mouse . One good feature to note though on the trackpad is that it has two physical keys which we think are really nice. The two keys are separated by a fingerprint scanner which can be used for unlocking the machine and other applications. Additionally, the Eluktronics N850EP6 Pro-X sports a 2.0MP Full HD Webcam & Array Mic which is pretty decent, but not extraordinary. Just a normal webcam for the occasional Skype calls. For connectivity, this laptop comes with an Intel Dual-Band Wireless-AC 9560 2×2 + Bluetooth 5.0 included with i7-8750H CPU option. Now here comes the most important part of this Eluktronics gaming laptop review. 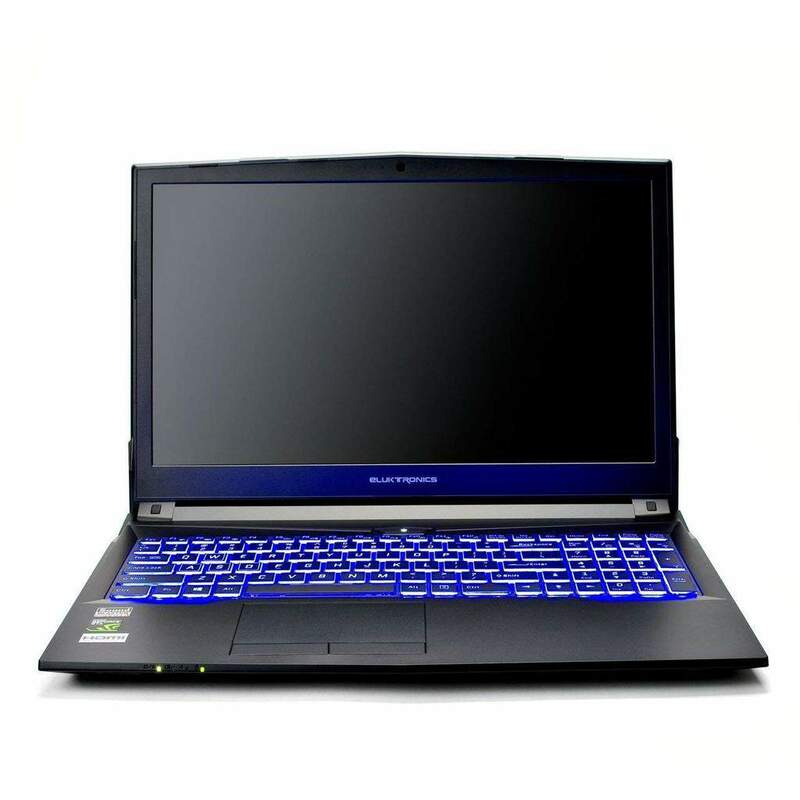 The Eluktronics N850EP6 Pro-X is powered by an i7-8750H Hexa Core processor. Alongside the processor, the laptop is preloaded with a with 16GB DDR4 RAM (with 2400 MHz spindle speed) and 256GB solid-state drive. The RAM is sufficient to handle heavy applications like graphics and video editing as well as gaming. There is an empty RAM slot if one needs to expand. As far as the storage goes, the 256GB flash drive comes in handy for shortening load times and loading software. The Core i7-8750H processor is one of Intel’s seven new Coffee Lake H-series processors designed for performance notebooks, workstations, and gaming laptops. It comes with 6 cores and 12 threads up from 4 core and 8 threads. Intel is pushing single-core performance higher with these new 8th gen processors. The two extra cores give it an edge over 4 cores. The 8750H hits a maximum of 4.1 GHz on a single core, up from 3.8 GHz on the 7700HQ. It’s also capable of this same 4.1 GHz clock speed on two cores, along with 4.0 GHz on up to four cores, and 3.9 GHz on up to six cores. Moving on, the last part of the puzzle is the NVIDIA® GeForce GTX 1050 Ti – a very impressive new GPU that has 4GB GDDR5 VRAM. We tested this laptop with a couple of AAA titles like FarCry, Call of duty, GTA 5 and Resident evil at 1080p resolution and it was able to achieve satisfying frame rates as expected and overall the premium components included in this laptop did deliver above and beyond expectations. We tested this laptop with a couple of AAA titles like FarCry, Call of duty, GTA 5 and Resident evil at 1080p resolution and it was able to achieve satisfying frame rates as expected and overall the premium components included in this laptop did deliver above and beyond expectations. So, is Eluktronics a good brand? Should you buy the Eluktronics N850EP6 Pro-X? There is more than meets the eye with Eluktronics N850EP6 Pro-X and it really does impress in terms of performance. Better yet, with a few upgrades and a good external display attached, it can even put some full-sized gaming PCs to shame. It’s easy to note that Eluktronics took some time to make some notable feature changes to this laptop. You can opt for a 7th Gen or 8th Gen processor among other options. What is common among all iterations though is that while it might not draw that gaming aesthetic look, for the most part, it has a subtle and not-so-eccentric look that appeals to a good number of users. If you appreciate a low toned design, high-end features, and muscle in your gaming laptop, the Eluktronics N850EP6 Pro-X is a great budget option to consider. P/S Check out these similar gaming laptops like the Acer Predator Helios 300 , MSI GE62VR Apache Pro-001 15.6 .